Contour beading is a technique whereby the stitching begins at a center point and goes outward in a circular or elliptical fashion that was developed by the artists of the Columbia River Plateau after the midpoint of the 19th century. The technique parallels that used in some basketry and suggests that it grew out of that tradition. ​This vibrant style is unique to this region which encompasses parts of Montana, Idaho, Oregon and Washington In the third quarter of the 19th century, Native women of the Columbia River Plateau began to make cloth bags with beaded front sections generally on red trade cloth. 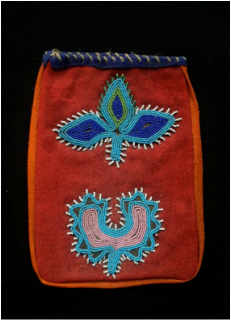 Initially, the bags were partially beaded against a trade cloth background, usually red (see #1 & #2). 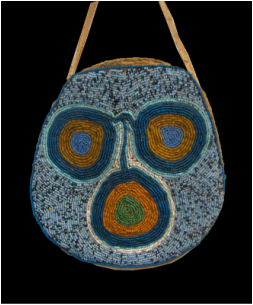 By the 1880’s, the bags had fully beaded backgrounds done contour style. They also became an important part of a woman’s public persona. In studio photographs from the era, Plateau woman invariably are holding either these bags or woven fiber bags which pre-date the use of cloth beaded bags. 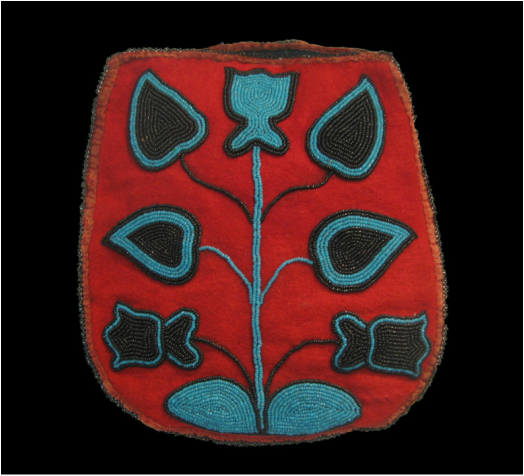 This style of beadwork was also used in other forms such as the belt pouch (#5) and the peace medal bag (#8) shown herein. Later on, at the turn of the century, the background of the bags were flat-stitched and the contour technique was limited to the design elements (see #7). The next development saw the contour technique limited to the outline of the figures and to indicate certain elements within those figures (see #9). <- 7) This bag dates from the turn of the 20th century and has a flat stitch background while the floral elements and the horse figure are beaded in contour. The horse was a favorite motif at the time.